Designed for young skin problems to gently reveal your natural brightness. Teenagers and young adults, who want their skin to look gorgeous and naturally bright. 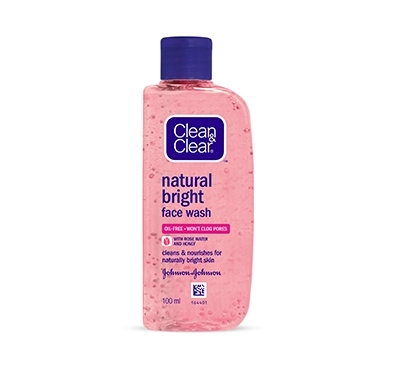 CLEAN & CLEAR® Natural Bright has a double action effect on your skin which helps clear skin problems. The rose water in the face wash helps wash away the dullness caused by impurities in the skin and natural honey with glycerin helps nourish your skin and help it achieve a natural glow that you will love. Apply a small amount on wet palm. Work it into a rich lather. Gently massage onto face, taking care to avoid contact with the eye area. Rinse off thoroughly. Use twice daily for skin that’s clean, clear and beautiful. Water,Glycerin, Sodium Laureth Sulfate, Lauryl Glucoside, Acrylates/C10-30 Alkyl Acrylate Crosspolymer, Citric Acid, Sodium Benzoate, Fragrance, Tetrasodium, EDTA, Capryloyl Glycine, 0-Cymen-5-ol, Sodium Benzotriazolyl Buytylphenol Sulfate, Sarcosine, Honey, Sodium Hydroxide, Rosa Damascena Flower Water, Cinnamomum Zeylancium Bark Extract, Cl 14700, Cl 17200, Potassium Sorbate. Water, Glycerin, Sodium Laureth Sulfate, Lauryl Glucoside, Acrylates/C10-30 Alkyl Acrylate Crosspolymer, Citric Acid, Sodium Benzoate, Fragrance, Tetrasodium, EDTA, Capryloyl Glycine, 0-Cymen-5-ol, Sodium Benzotriazolyl Buytylphenol Sulfate, Sarcosine, Honey, Sodium Hydroxide, Rosa Damascena Flower Water, Cinnamomum Zeylancium Bark Extract, Cl 14700, Cl 17200, Potassium Sorbate.